Seattle, February 2076. The Marq'ssan bring business as usual to a screeching halt all over the world, and Professor Kay Zeldin joins Robert Sedgewick, US Chief of Security Services, in his war against the invaders. Soon Kay is making rather than writing history. But as she goes head-to-head against the Marq'ssan, the long-buried secrets of her past resurface, and her conflicts with Sedgewick and Security Services multiply. She faces terrifying choices. Her worldview—her very grip on reality—is turned inside out. Whose side is she really on? And how far will she go in serving that side? "The coupling of real thoughtfulness and rip-roaring excitement is as rare in science fiction as in any other genre. But here, in Alanya to Alanya, they're locked together in the most exciting—and certainly the most intelligent!—tale of alien invasion I've read in decades. Because it is believable, it's fascinating. And, in the years that have seen Margaret Thatcher go and Hillary Clinton and Condoleezza Rice arrive, Kay Zeldin is an extraordinarily effective portrait of a political hero." "Alanya to Alanya does just what a political sf novel should do: it leavens its political message with first-rate futuristic extrapolation, chilling dystopianism and a breathless adventure story that keeps you turning the pages. It was a refreshing read and a rare example of deft political storytelling." 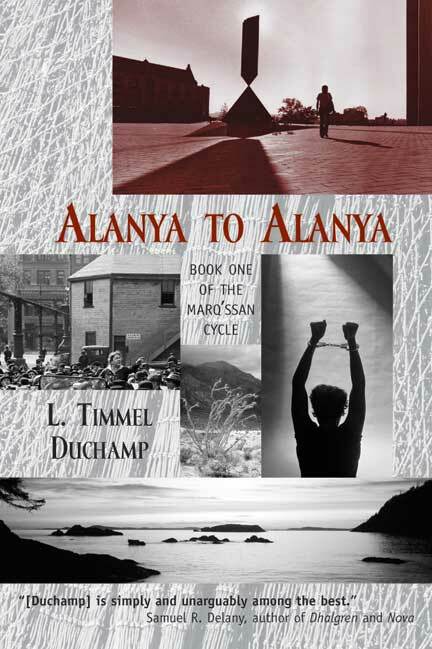 "Readers who still appreciate the anger and surety of those early works can take heart at the publication of L. Timmel Duchamp's Alanya to Alanya...[T]hose with a serious interest in dystopias and particularly the feminist version thereof should find L. Timmel Duchamp's Marq'ssan Cycle a rewarding experience." "Politically savvy and philosophically relevant, this title puts a human face on today's problems." "Alanya to Alanya is SF on a broader scale, with The War of the Worlds as one inspiration, but its metaphors apply to a very human tangle of loyalty and betrayal, politics and idealism—Wells and Orwell updated for the end of the 20th century." "[Duchamp's] political world building has a level of detail and believability that rivals Bruce Sterling at his best, and her pacing is much better than most other books driven so heavily by political concepts, such as Ayn Rand's Atlas Shrugged or Sheri S. Tepper's The Gate to Women's Country." "This is the first of a five novel series which mixes politics, aliens, and a variety of feminist and political issues which might easily have become unreadably polemic and convoluted, but which is surprisingly readable and entertaining despite its heavy load of subtext." "Alanya to Alanya is not so much an exploration of the way humanity responds to an alien presence as an illustration of how a world under siege from its own governments finally revolts; the invaders are simply the catalyst for change." "My 'discovery' of the work of L. Timmel Duchamp was, as usual, pure serendipity...her intellectual grounding and her political activism both contribute to create a novel that is highly readable and as politically relevant as any novel I can recall."